Metrosexual, bogan, modern man... trends regarding the acceptable level of male grooming change so often that it's hard for guys to know just how much preening is too much. If your style is somewhere between the old Shane Warne and Shane Warne 2.0, it's time for you to find yourself a barber. Why? Because they're the only place left on earth where it's acceptable to exclude women, making them an undeniably masculine environment. 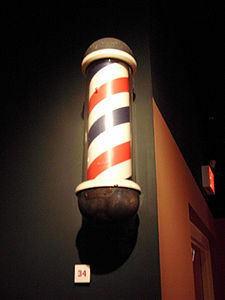 And today's barbers offer a mix of traditional and modern services, so if you secretly like to get a blow dry or scalp massage, you can do so at a barbershop without shame. Barber's are trained in cutting men's hair so not only will you benefit from that expertise, you also won't have to talk a trendy young hairdresser out of giving you an emo fringe. Most places include a neck shave and hot towel service in the cost of your cut. Three words – cut throat shave. Check the Yellow Pages for your nearest barber, or ask your grandfather.